Mari's parents watched the little ones on Saturday night so we could go out on a little date after visiting Noah and Finn. It did feel good to put on some real clothes and hit the town. Oh, how dates have changed. We had 8:30pm reservation at Crapitto's (I know, it doesn't sound like a good restaurant) for a nice dinner al fresco. By 7pm we were asking each other why we made such a late reservation and that we should go early and then get one of those hotel rooms by the hour - not for that, to take a nap! Like I said, date night has changed. We had a great time on our date and made it back home for the 12am feeding to relieve the weary grandparents. Mari looks amazing and as stunning as she did when we first met! 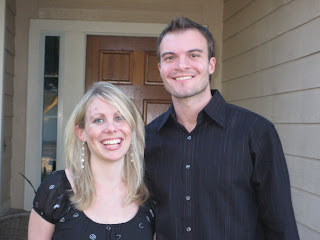 We were checking out our friend Suz's blog yesterday (http://thelifeofsuz.blogspot.com/). Mari and her were keeping up with each other during pregnancy. Suz had her babies 1 month before we did. Her little girl has reflux really bad and does what Finn does when he eats. This time, she threw up while sleeping on her back and thankfully, Suz saw this on the video monitor and ran into the room. Her little girl was not breathing and Suz had to do CPR to revive her - a parent's worst nightmare. Praise God she is ok! This could happen to any parent so make sure you take infant CPR class. This incident helped us realize that we do not need to rush Finn to get home and to just let time and God do their thing. "Only three things really matter in life: Faith, Hope and Love. But the greatest of these is LOVE." 1 Cor. 13. It is shining in your eyes! The babies are just as beautiful as you two are. I know you are eager to get Noah and Finn home, it will happen when it is time. Please make sure that an ostomy RN, an ET nurse or an enterostomal nurse is looking after Noah's ostomy and skin. These specialized nurses can be called any of those three titles. They have all sorts of tricks of the trade and special products and appliances and skin protectants in their arsenal. Make sure these specialists are on the job. Keeping my prayers going for the boys to get better and get home with their siblings. Thank you so much for sharing Savannah's story. My neighbor and I just arranged two weeks ago to alternate babysitting so we could take CPR classes with our husbands. I am also very glad to hear about your date night! Everyone looks great. Those babies are tooo precious!